Sighting in firearms can sometimes be challenging as well as frustrating. We can assist you in sighting in your firearms. For Pistols, we use the Hyskore Parallax Pistol Sighting System. The Hyskore Parallax Pistol Vise and Shooting Rest multiple support points coupled with precise windage and elevation adjustments make this shooting rest stable and invaluable at the range. Guns are fully supported for accurate sighting in. 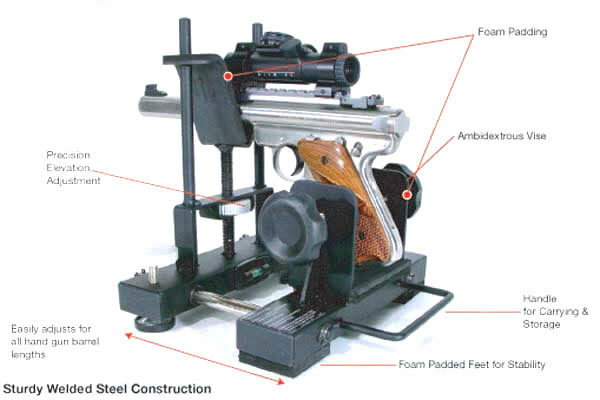 This rest and vise is padded to protect the finish on your firearm. The rest features precision elevation adjustment, welded steel construction, a carry handle and will adjust to any barrel length. Most rifles have scopes or adjustable sights and we can assist you in sighting in your rifle. Rifle scopes work by magnifying an image and by placing your eye on the same optic plane as your target. Since magnification works by bending light rays via a number of lenses within the scope, the higher the power of magnification, the longer the scope. In other words, low powered rifle scopes are shorter and contain smaller lenses. 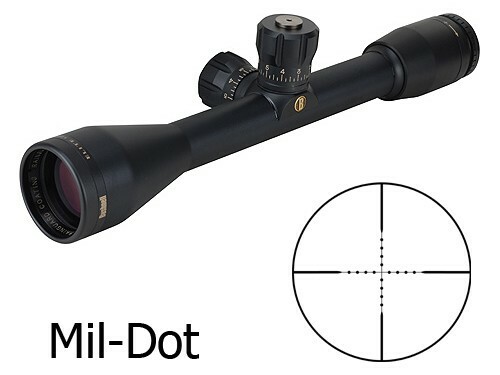 The similarities that all riflescopes share include a reticular or crosshair, a dot, a post or similar markings to help align the device with the target. A reticle or crosshair is a shape, usually a " +" shape, superimposed on an image (target) to aid with the alignment of the device. Some reticles use dots to mark the center of field of view or a post or similar markings to help view and centre the image through the scope. Rifle scopes also work to eliminate the problems associated with open sights, and allow for precise shooting.